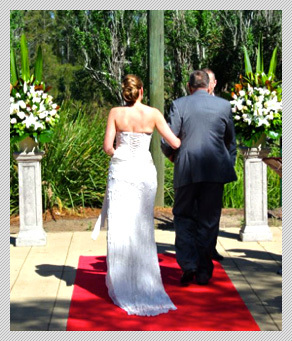 CELEBRATE WITH US - Concealed in the natural wonderland of Parramatta Park, just a short distance from historic churches and surrounded by magnificent jacarandas is the elegant Parramatta Park Event Centre. We are located within the “Old Visitors Centre” building in historic Parramatta Park. 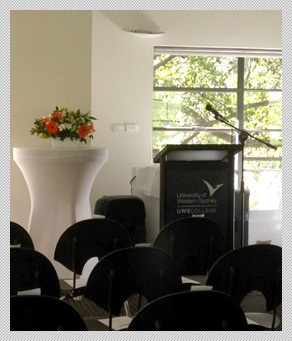 I have had the privilege of hosting 3 events at parramatta park cafe & event centre. That itself should speak volumes about the venue, it's staff & their service. On every single occasion, the staff have been more then attentive towards myself and all my guests. They have always been on top of everything, from helping to prepare the venue to making sure that every little detail is met with perfection from start to finish. One of the most important and crowd pleasing things about an event is food ! I've had both the sit down menu & buffet menu and both had been a hit ! Can always rely on good food here ! Lastly, being able to keep a customer & their guests exceptionally happy on more then one occasion just shows how committed and professional the staff are, especially the cafe & events manager Emma. So thank you once again for putting so much effort into everything you do in order to leave your customers happy !! Emma, I can't thank you enough for last night. It was truly the best night ever, everything was perfect and you have been so wonderful and helpful from beginning to end. Many thanks to you and your staff for a fantastic, memorable evening. I would like to say a big thank you to you and your staff for the way you organised the ladies lunch for my daughters Kitchen Tea on Sunday. The staff were all very well organised, friendly and efficient in their duties; they made our guests feel very welcome with their friendly smiles and even though they were busy with the café and function room, they couldn’t do enough to help Jessica, our guests and myself throughout the event. The meals were excellent quality and delicious, they were served on time and beautifully presented; the only complaints I heard from our guests is the serves were so big that they felt bad they couldn’t finish everything on their plates. 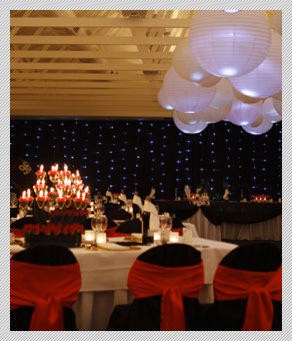 I would definitely recommend Parramatta Event Centre to anyone looking for a quality venue to hold their function. Thank you again & kind regards, Joanne, A very happy Mother of the Bride. We really enjoyed having our training at your venue, the food was great and your staff were lovely and so helpful with everything. Thanks for your assistance with our event. On behalf of the AMPC I'd like to thank you and your wonderful team for hosting us this morning. Everything was lovely. The food, the decor and your hospitality is to be commended. We look forward to working with you in the future. Thankyou so much Emma, the night went off brilliantly, we were very happy with all aspects of the evening. It was such a pleasure to work with you and you team, thank you for helping making to make the evening a success for us. How do I even begin to thank you for last night? Thank you so so much to you and your staff for EVERYTHING. The party was amazing and the birthday boy absolutely loved it. Everyone loved the food and were saying that the venue was amazing. You went above and beyond and we are so grateful. Thank you!!!!!! We had a great day. The facilities and catering were great, and in particular the vegan food was fabulous! Yesterday I had a High Tea for the Grandparents and Aunties celebrating my Daughter's 21st, there was 23 in total. We could not fault a thing the staff went out of their way to make us comfortable, the food was outstanding and at no point were we rushed to leave. A big thanks to Emma and Staff for creating an amazing memory. Thank you very much for all your help with organising our meetings. The catering was delicious and went very smoothly and all your staff were more than helpful. All attendees commented on how beautiful the venue was and we shall certainly be using your facilities for future similar events. Thanks so much for helping to make Mum's 80th a very happy and memorable event. All comments form those who attended were very positive. Thanks again. Thank you so much for helping us make it such a great night. You run a fabulous venue & I hope we will meet again soon. I am bragging to as many people as will listen. Thank you for going above & beyond the call of duty. You are fabulous. Thank you soo much for your staff hospitality and organisation.. You have been so helpful. I appreciate everything you did to help make the day special for us. I recommend a couple of friends to have their upcoming parties at your venue as they were very impressed. It was perfect, thank you so very much. We are very happy that we chose Parramatta Event Centre, just the perfect spot for Mum's party. The food you served us was spot on, plenty for all our guests, we were especially happy with the lovely way the lamb was cooked. The venue was such a good space for us, perfect size. Please accept our sincere appreciation, we will be recommending you to our friends. Please thank 'T' especially she was so lovely and helpful, sorry I forgot the other names but please thank them as well and your kitchen staff. Emma, a special thank you for organising our day we all felt so comfortable and relaxed. Having the private space instead of going to a restaurant was so nice as we had lots of family catching up to do. Best wishes to you and your staff. We had a wonderful time. You and your staff were very easy to work with and a pleasure to do business with. The food was lovely and cooked as requested. Thank you for making Mum’s birthday such a wonderful event. Thank you very much for a lovely event. We all enjoyed ourselves and all our guests gave very positive feedback. We certainly plan to be back for the next family celebration. It was UH-MAZINGGGGG!!!! Thank you so much!!! The lolly table was sensational!!!! The kids had an amazing time and everything was beautiful!! Thanks heaps! The function went really well and the balloon arrangements your organised were wonderful. The food and staff was exceptionally great ! Thanks for looking after us, muchly appreciated. Thank you for hosting a great Bucks nights. We had a ball. You catered to perfection, and you and your family will receive calls to repeat it in the future. On behalf of myself & my extended family, I would like to congratulate you & your staff on the excellent standard of catering & event management at today's celebration of my father's 90th birthday at Parramatta Park Event Centre. I had very positive feedback from many people about the quality of the food, as well as the venue itself. Thank you once again! Thank you so much for everything! We all enjoyed the food and everyone was talking about it yesterday how good the food was and how nice the venue is. We will definitely consider holding another function there again. Thank you again for your help and patience in helping us with my sister's high tea. We all enjoyed the afternoon and it was exactly the relaxed setting we had wanted. Thanks again. Once again you guys did an amazing job. Everyone really enjoyed themselves and the food! There was ample amounts of it and very tasty. Mum was impressed with her personal gluten free platter too. Thank you for being able to cater for her. We really appreciate the great service from your staff and being able to use a clean, well set out, convenient venue. Thank you again and we'll see you at the next function we organise with you! We had a very enjoyable lunch. The food was delicious and was served promptly by your friendly staff. It was the first time a lot of us had been into the park and we will definitely be back. We had a good day. Staff were great. Nothing was too much trouble and the coffee was great! Equip all good and I loved the fact that I could plug in my iPhone and play music during the breaks! Plenty of space to be able to break into groups. Emma! THANK YOU for everything. The venue was absolutely perfect and everything went so smoothly. Thank you for all you hours of help and emails and planning and everything else. We are so grateful for all your assistance and are so glad we could get married at your venue - it was amazing. Thank you Emma for all your help in organising Derek’s birthday brunch. Please give a big thank you to the young lady who was looking after us. She did things very quietly and in an unobtrusive way and was very helpful when I needed things. I especially appreciated her getting more chairs for us, when I had said earlier that we did not need a chair for each person. We have had lots of positive feedback about the venue, the food and the whole morning, so thank you. Hi Emma, we had an amazing time on Saturday, everything was perfect! Thank you so much for your help and amazing organisational skills! You and your staff are fabulous! Thank you for hosting our most successful Xmas party to date! I received wonderful feedback! I can’t thank you enough! I had the privilege of hosting my daughters Christening at the event center & I honestly can't thank the staff enough for going above & beyond to ensure that everything went perfect. Superb food, service, commitment & the ability to leave a customer walking out happier than ever expected is what you'll receive from this beautifully run family business. Can't wait to see all the staff soon & especially Emma!! Thank you again !! Clavelle. This is a big thank you to all of you for a wonderful Breakfast. It was very efficient and you made it very easy for us. Thank you so much. Blessings to you all from the CBC Cycling Group. Hi Emma. Thanks so much for all your work, everyone commented that the venue was lovely and the food was great too. Really happy with how everything went, so thank you so much! Just wanted to send a very big, in fact HUGE thank you for Saturday! Everything went like clockwork and the people were so happy with the way it all went. The service was fantastic, everyone got THEIR meal in a very short time and the meals were GREAT! (and it was a very good idea to eat inside on that day!) THANK YOU! and please send a special thanks to all your staff! Thank you for your support of our booking. We had a lovely day at Parra Park. The venue was perfect, the food amazing. The staff were very helpful and obliging. Congratulations to your team. We will be back. Everything was just perfect, thank you. My son had a wonderful celebration and all the guests made positive comments about the venue, service and food. Everything was brilliant, room was great – food beautiful, everyone very friendly, we’ll definitely be back! Hi Emma We had a wonderful day, the room was excellent, and location, beautiful and serene. Service was also excellent, prompt and attentive and facilities very good. Food was fabulous! Hi Emma, Just wanted to say a big thank you to the staff at Parramatta Park Cafe for our wonderful visit this morning. We were really delighted by the great coffee, delicious meals and friendly service during our relaxed family brunch. We’ll definitely be recommending the park and cafe to friends and family who might find themselves in the area! Thank you Emma! It was a fantastic Birthday Party and not only did you guys contribute to its success, but you made it so easy for me!!! You made sure nothing was a problem! Thank you! The party was named by our guests as the best kids party they had ever been to! It was a hit! Many thanks for another great start to an excellent day. We have used the cafe for six rally starts and each one has been excellent. As usual everyone was very complimentary about the cafe and the breakfast. The feedback was wonderful “excellent food” “wonderful venue” “great ambience for our yoga workshop” . So you can see people were really hooked on the space :) Thank you again for your wonderful organisation, food and venue. Your people were very helpful which made the weekend go very smoothly indeed. I would certainly recommend your Events Centre to others. On Friday 28 March 15 members of our Craft Group had an excursion to an exhibition at Old Government House in Parramatta. Our timed entry there was 12- 1.30 p.m. and we decided to have a late lunch after that. The week before our excursion, I contacted Parramatta Park Cafe/Event Centre and spoke to Emma and she was extremely helpful, suggesting we go into their website and download the menu and pre-order our lunch. This was very easy to do and our group had time to peruse the menu and decide what they would like and then I emailed it through.. They also suggested that I ring them 15 minutes before we were leaving the exhibition and they would start preparing our lunch so it would be ready on our arrival at the Cafe. This I did and when we were all seated the lunch came out. We had a variety of things from the menu and everyone agreed it was all delicious and the staff were very efficient and helpful. We were seated out on the verandah overlooking the river and as the sun was out, it was delightful and really good for a large group. One small point to note, if you are organising a group to visit the Cafe, is that there are no split bills. We were advised of this prior to our visit so we all brought "smaller money" (no $50 notes) on the day and it all worked out very well. As we were a group we also car pooled to reduce the amount of parking spaces we would use. I would highly recommend this Cafe as a lunch venue and even though we didn't try any of the cakes or sweet things on the day, it would be a very pleasant space to go to for morning tea. We would certainly go back to this Cafe. I just wanted to drop you a line to say thank you so much for your excellent, friendly service and for being so accommodating with our large party yesterday! (We were the 25 or so ladies at 11am). Everyone had a lovely time, the food was great, and you all made us feel at home. Thank you for a very scrumptious lunch, everyone enjoyed their meals. The service was excellent and the location was beautiful. We will all certainly return. Thank you so much Emma & staff! You were a dream to work with & made the whole process so easy for us! Gorgeous location and an amazing team! A big thank you to you and the wonderful staff who cooked for us and served our meals on Thursday. It was very hot so a long table was set up inside which was great. We had a lovely day out in the Parramatta area and everyone said that their meals were delicious. Mine certainly was. Dear Emma, We want you to know that we are very pleased with the quality of service we have received and you made our big day yet more special! We sincerely appreciate your responsiveness and the way you conduct business. We have recommended you and your venue to others because of our satisfaction with your service. Our daughter’s 1st Birthday was just perfect, thank you sooo much for everything starting from beautiful decorations, food & drinks.... to very friendly and professional service! We look forward to celebrating other special occasions at your beautiful venue and your staff and with you for years to come. THANK YOU VERY MUCH!!!! Mio, Emma and Bosa. We would like to truly thank Emma and the team at Parramatta Park Event Centre for their role in making our Engagement Party such a perfect night. Emma went above and beyond to make the night special for us. Her professionalism, dedication and friendship on and leading up to the day was greatly appreciated. I had confidence that every aspect of the evening was taken care of and sure enough it was. Everything went very smoothly and everyone had a great time. The venue looked fabulous, the food was delicious and the attention by all the staff was excellent. Thank you for taking such care of us and our guests, we had a perfect night. Firstly I would like thank you for your efforts in making our night a memorable one. The venue was very well presented, the staff were very efficient and courteous and most importantly the food was very nice as expected. I also would like to thank you for affording us your professional courtesy which facilitated in our function to be delivered as we expected. I have no hesitation in recommending Parramatta Park Event Centre and Emma to my friends, family and colleagues. Our experience of PPEC was outstanding from start to finish, in every detail. The beautiful, convenient location and the reasonable prices attracted our attention initially; however it was the staff that made our day so fantastic. Their competency, flexibility and warmth were overwhelming, the perfect combination for anyone planning an event, especially a wedding. The staff went above and beyond in their efforts; nothing was too much to ask, with quick and comprehensive replies to all forms of communications, a readiness to make themselves and the centre available to us at our convenience, providing helpful information and seeking to fulfill all our requests. The taste and the presentation of the food were astounding, and the friendliness of the wait staff and chef made planning our reception an enjoyable experience. The simplicity and practicality of the venue were the ideal blank canvas enabling us create our own unique atmosphere. It’s stunning outlook, outdoor areas, great for guests with children, and airy feel cast a wonderful ambience and the lighting was perfect for photography. Our guests were impressed with the venue; many locals considering it a great discovery. There were no hidden costs and the first impression was genuine. A great event was made into a magical celebration.